New York City during in December is unlike anything else. Since Christmas is widely celebrated in New York City, the city is decorated with glittery lights, department stores put up beautiful window displays, the snow transforms the city into a magical winter wonderland and the holiday vibes fill the entire city. Here are five New York City attractions exclusively available in December, so you can enjoy this once-a-year festive atmosphere to its fullest. Want to spend December in NYC? We’ll help you find your room. People in New York will mark the end of 2013 and start of 2014 with a 4 mile Midnight Run on December 31. Nearly 4,000 runners participate in this crazy event; some take the run seriously, but most participate in order to start the New Year on an exciting note. The Midnight Run takes place in Central Park, and offers a firework show, a laser light show and music. The run begins the moment the clock strikes twelve, just as the New Year begins. Some people decide to dress up for the event and even perform dances to celebrate. There are prizes and bonuses to win, a grand party to attend and champagne at the starting line. The Midnight Run requires a $60 entry fee. 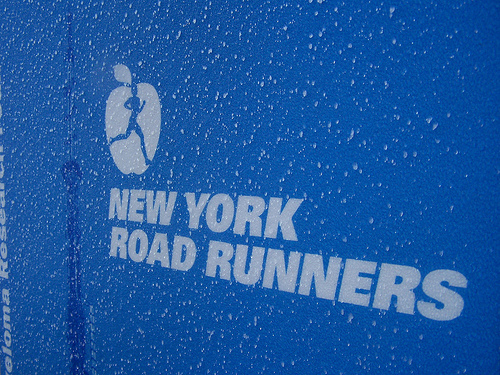 New York runners will ring in 2014 with a 4 mile run. 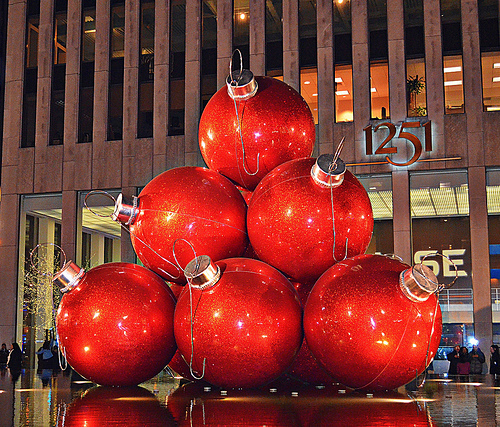 Explore the holiday magic of New York City in on the New York City Holiday Lights Tour. The most special part of the tour: it’s not limited to the bus. Rather, the bus will take you from place to place, and you’ll get off the bus with the guide to experience New York City the way it should be experienced. The tour visits New York’s most iconic places, such as: Times Square, the Christmas window displays on 5th Avenue and Herald Square, Lincoln Center, Time Warner Center and Columbus Circle, Central Park and the Central Park Zoo, Rockefeller Center Christmas Tree and Holiday Market at Bryant Park. Tickets are $80 per person; the tour leaves from 50th Street & 7th Avenue at 7pm nightly and is available through January 5. Admire the beautiful street decoration whilst on the Holiday Lights Tour. Christmas in New York City wouldn’t be the same without Rockefeller Center’s 76-foot-tall Christmas tree in midtown Manhattan. Every winter, millions of visitors come see the tree’s 30,000 lights. The tree has been put up after every Thanksgiving since 1933, and it stays put until the first week of January. Ice skating at Rockefeller Ice Rink is the perfect activity to enjoy the holiday spirit and the picturesque view of the Christmas tree. Sessions cost $27 for adults, $15 for kids, and $15 for seniors, and skate rental costs $12 per person. 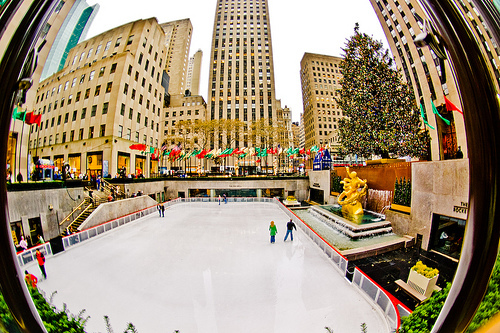 Go ice skating at the Rockefeller Center and take a picture with the huge beautiful Christmas tree. For 75 years now, the Radio City Christmas Spectacular has entertained theater patrons during the Christmas holidays with family-friendly shows, featuring Santa, wooden soldiers, and the spunky Rockettes. The show is held at the historic Radio City Music Hall in Midtown Manhattan, the largest indoor theater in the world. Discount tickets are available, but don’t wait until the last minute – the Radio City Christmas Spectacular sells out every year! Ticket costs range from $90 to $470. 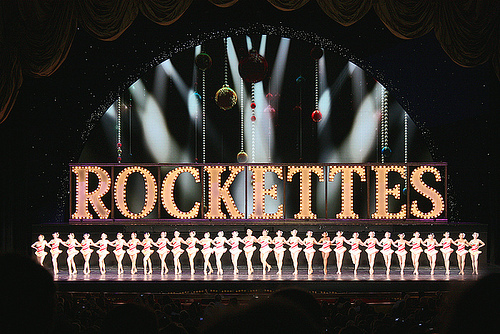 Go see the spunky Rockettes during the Christmas holidays. 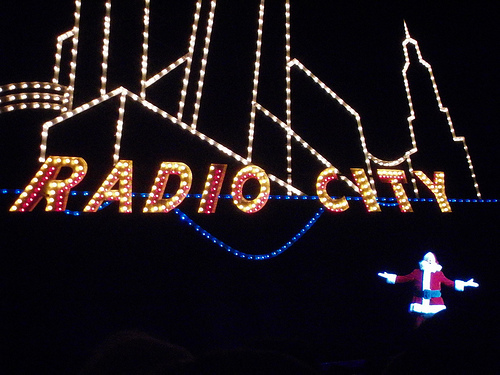 Santa performing at Radio City Christmas Spectacular. There are various holiday markets that spring up around Manhattan every December and they’ll guarantee the perfect holiday winter vibe by making you feel as if you’ve entered a winter wonderland. The city’s largest market is located on Union Square. After visiting the market, you can pick up a hot chocolate at Max Brenner on Broadway between 13th and 14th. Another famous holiday market is located at Bryant Park: 125 artisans are selling everything from clothing and accessories to food and hot drinks. Want to experience the same winter vibe? Don’t wait too long, and find your hotel for New York City now! This entry was posted in Cities, Holidays, Travel and tagged Bryant Park, Holiday Lights Tour, Holiday Market, New Year, New York City, New York Midnight Run, Radio City Christmas Spectacular, Radio City Music Hall, Road Runners, Rockefeller Center Christmas Tree, Rockettes, Roomertravel, winter by shellyrahminov. Bookmark the permalink.